Renault expects a production version of the Zoe concept to account for most of its EV sales. 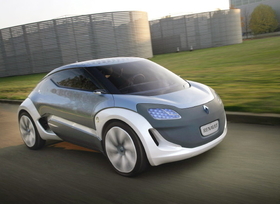 Renault will build three of its new range of four electric cars in France and Spain. Last week, the French automaker said it will produce its core-range electric model, a minicar, in its Flins plant, near Paris, starting in 2012. Renault expects the minicar to account for two-thirds of the company's electric car sales in Europe, making Flins a central hub for production of Renault's zero-emission vehicles. Flins will build a production version of the Zoe Z.E. concept unveiled at the Frankfurt auto show in September. The concept is a four-seat minicar intended to be used for short daily journeys in urban areas. On Monday, Renault said it will build an electric version of its Kangoo car-derived van in Maubeuge, northern France, starting in the first half of 2011. The electric Kangoo will be built on the same production line as gasoline and diesel versions. Renault will build a production version of its Twizy Z.E. city car concept in its Valladolid plant, 150km northwest of Madrid. The concept is a 1+1 city car with a footprint barely larger than a scooter at 2300mm long and 1130mm wide. 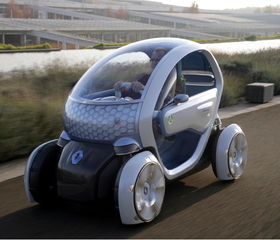 Renault unveiled the Zoe Z.E., Twizy Z.E. and Kangoo concepts in Frankfurt along with an electric version of its Fluence sedan. A production version of the Twizy will be build in Spain.